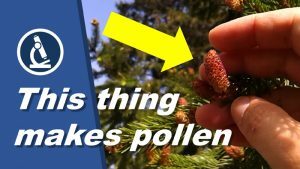 Here I show you how to make a dry-mount using spruce pollen. A dry mount does not use any mounting medium and the pollen are placed directly on a slide with a cover glass on top. I use a slide with a depression. These are more expensive but do not squash the specimen. Using a home-made slide ringing table, I experimented with sealing the cover glass.